So, the new G.I. Joe movie? It's been delayed for about 9 months. I assumed for maternity leave, but not so. 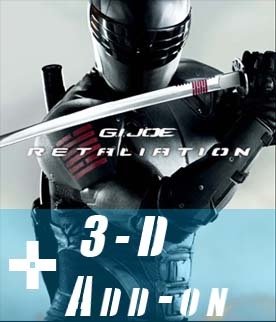 They claim to want to add 3-D, but that doesn't take that long. Likely they don't want to compete with other summer movies. I haven't seen Battleship, and don't plan to, but G.I. Joe was probably as good as that, and Battleship....well, sank. So they are likely to rewrite stuff. 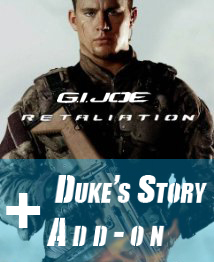 According to one article I read, they are adding in some more story with Duke, and not killing him. Good call, I guess. The first movie was mediocre, but I didn't like the idea from the trailer that they just killed off everybody but Snake-eyes and the Rock. Then, a few months after that, say when the 9 months are up, just sell this to moviegoers for a few bucks. You know, I could be on to something here. It's not hard to see where this culminates. When released on video, bundle them all together for the G.I. Joe: Retaliation MotY (movie of the year) Edition! It's very sad that a few days ago Studio 38 and Big Huge Games were shut down due to lack of funds and lack of good management. While Curt Shilling is not 100% to blame, I'm sure he personally lost no money in this. Of course, 300+ people suffered from his bullcrap. This makes me feel even worse that I couldn't afford to get Reckoning. Well, maybe I could have, instead of getting a few $10 games just saving up 60, but I know that one day I will own the game. And the DLC. This world that was assuredly better than Albion will now not be fully realized. Maybe Rhode Island would like to donate that IP to, say, a starving artist father....heh, yeah I don't think so either. I'm sure they will sell the IP to some company (EA?) for a few bucks to make up the loss. Still, that is of no consolation to the many talented men and women that formerly worked for 38 and BHG. Hopefully they will find jobs elsewhere, at better run companies. So after having some time with the game, I should get to my full review of The Witcher 2: EE. I'm going to talk about the areas that I use in my "Late to the Party" reviews. The graphics are amazing in The Witcher 2: EE. They are the best I've seen of any Western RPG, and easily some of the best I've seen in any game. A lot of the scenery is the normal WRPG pallet of brown and grey, but some armor, hair and monsters take advantage of other colors. This brightens up the look of the game, somehow makes it look more realistic and removes the stereotype it could find itself in. The characters are great. They move very naturally and look fantastic. The environments are lush, detailed and are very believable. I especially like the intro cut-scene. The graphics are the highest caliber there. While they should be, it looks so good you know the rest of the game will too. The vocal quality to this game is high. No one I encountered was annoying and the characters actually sounded like people, not someone just doing a voice. The main character comes off a bit like Christian Bale's Batman, but not as much as the main character from Two Worlds II. The music is fine for the game. Nothing really stood out as particularly great, but it all at least "fit". There was no death metal or J-Pop blasting in during fights or something of that nature. Here is where the game will suffer for some. Having 2 different swords, one better on monsters and the other better on humans is a cool idea. I did have trouble telling them apart, as they appear pretty similar and you would have to think in advance to draw the one better suited to the fight because it can be very hard to tell which is which in a pinch. The controls mostly were fine, bringing up the menu is the back button, but there is no shortcut for the map, which would've been nice. Moving through the menus was cumbersome and never really "clicked" with me, I must say. Being able to tell what I had equipped wasn't as clear cut as I would've liked and I had a hard time telling if equipment I was looking at was better than what I had. Also, using items and trowing daggers was really awkward to me. The time-slowing effect was very needed, but I still didn't want to use it at all, it didn't seem..."right", if that makes sense. It also didn't click with me. Controls for the minigames were not clear to me. Maybe they were explained in the instruction book, but I didn't get that with my copy. An in-game lookup would've been helpful. I'm not looking to be hand-held, but the ability to check in some menu in game should be there. Difficulty. You can't really talk about this game without bringing it up. The game is hard, no two ways about it. After the brief and cumbersome tutorial, the game suggested I play on easy. As a grown man that has played video games for 20 years, and this type of game is one of my strengths, I was a little offended. After all, this isn't a first person shooter. I play RPGs and action RPGs all the time. I love those games. So I soldiered on with the "Normal" setting. I feel that the normal setting should be completable with few troubles by someone who knows the type of game. The Witcher 2: EE isn't like that at all. I never actually put it down to easy, so I saw many a game over screen, even in the first hour of playing. Humbling and ridiculous at the same time. I can't even imagine the hardest difficulty setting. I wanted to show a picture of the "Game Over" screen, but you will see it enough on your own. I don't feel like a badass when a normal soldier (or three) can kill me in 3 hits. Each fight was an exercise in trial and error. I saved a lot, which saved me some swearing. Blocking helped, but you cannot block 360 degrees until level 7, and enemies are smart enough to take advantage of that. On the normal setting. Too brutal for my tastes. Being an RPG, you can expect it to have a respectable length. I've heard at least 20+ hours if not hunting down every sidequest and such. I imagine that is what the game clock says. Much like Punch-Out, you will spend much more time in dying that likely isn't reflected on the in-game timer. There is an achievement for beating the game on the hardest difficulty setting, which I can imagine is a frustrating and time consuming task. You will likely get your money's worth there. There is no online whatsoever, so nothing much to say about that. I'm always glad for another single player game, though. There is a fair amount of extra things to do. Many small choices or events give the player small permanent buffs. This I like, although the completionist in me screams when I found out that I've missed one. Also, while I knew about it ahead of time, I still love the Assassin's Creed joke/easter egg. I'll be honest, my review copy didn't come with the extras that paying people get, so I can't comment on them. They look awesome, and my wife would appreciate the soundtrack, but I didn't get those. Surprisingly, I didn't even get an instruction booklet....and that sucked. So, the question is, did I have fun with this game? Is it worth picking up? In short, yes, I had some fun with it. It was hard to work up the urge to play, knowing that I would die time and again, but I could sometimes manage it. I like the style of game, so that helped. If you want to buy it, $60 seems fair, but around launch it could be purchased for $45. That is a much better deal, but be prepared for the difficulty. Before attempting The Witcher 2: EE, slam your fingers in a car door a few times so you are used to pain, then enjoy. Yay, I'm happy to post my first video review of a game. I choose Sengoku Basara, since it fits with the theme of my reviews, which is games that are older, cheaper, and likely overlooked by the masses. Getting the audio loud enough was a pain in the....uh, neck, but I used some old college knowledge to get it decent. I'm also trying to use the audio software I have to clean up the audio for the Monster Hunter videos. You can sometimes hear me breathing (not pleasant), but if I mute that, there's the audio click. I'm not sure which is better, so it may take a bit longer than I'd like. However, I should be getting some more footage tomorrow night. Last night I made a few videos of Monster Hunter Tri. Inspired by Miles923 from YouTube fame, I'm going to put some up with commentary so people can see some playing of it. Also find out how monsters fight and how 1 guy (me) fights them. I've got to edit them and such, but they should be up in the next few weeks. I am glad to be playing it again, even if I am starting over. I'll explain that sometime. While I don't think the God of War series is the greatest game ever released, I was very sad to see the news yesterday that the next one will have multiplayer "added in". The sad reality is that putting multiplayer in a single player game does take some resources away from some point in the chain. I understand that companies shoehorn in some MP because of used game sales. If someone beats a single player game, they sometimes then just go trade it in. While I don't believe tacking on multiplayer is the best answer, as said I do understand. Also I understand that I hate it. I was talking about this to my friend, and trying to think of any actual single player games left. He said Zelda, but I feel like the four swords adventures stuff, while technically separate, means they have at least dabbled. He then thought of Tomb Raider, but I felt like the downloadable one (Guardian of Light I think) had co-op, so that is probably out. Lastly he came to Devil May Cry. That I agreed on. Although, I don't believe that the western developer hasn't at least thought of putting it in. So, any readers, what do you think? Are there many single player only games left? I discounted things that weren't series (yet), or only had like 2 game (Infamous), as I felt they haven't had enough time to get to "let's shove in multiplayer" mode. Should I count Zelda and Tomb Raider as still being single player? As a final note, I'm okay with multiplayer as long as it makes sense. Don't just throw it in there to try and add longevity. It's a bad idea to do that. I love co-op, but again, don't just tack it on. Gamers know when it's added on. We aren't 5 years old. Edit: What about the Elder Scrolls? Surely, they are.....oh. Damn.